I had my Civic rear brakes free inspection checked at Pepboys and I noticed that there is another hole on both sides of the lower arm that the strut connects to. Question: Can I move the strut over to that hole which is higher up on the lower arm? The reason I asked is that I carry heavy loads once a month about 2 hours driving and my rear end is sagging too much. It also bottoms out when I go over big bumps without any load in the rear. 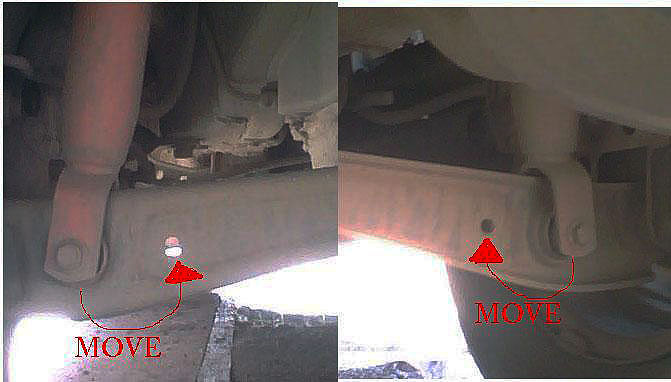 I have already replaced the original struts with Koni Lifetime street struts last year but didn't really help much! Plus it's not your shocks that carry the load. Its your springs that are carrying the weight. You'd need different springs to make any difference. What is that extra hole for ? So you're saying that I can NOT move it up to that hole, correct? Where is a good place to look for heavier duty springs? LOL no. The hole it is currently in has a bushing on it. The hole you are referring to is for your sway bar end links if you had a rear sway bar (came factory on SI models and maybe an option for others). Additionally, where the strut bolts to the chassis of the car will not allow you to move the lower bolt to that location without modification. I would highly suggest NOT to even try this. Got it! I'll look for some springs! Any ideas for heavy duty ones? You want stiffer springs? I would research a little more about spring rates and the like. DX engine Block has hole in it, What can I replace the engine with? Can I Use Dipstick Hole to Fill ATF? Help! Rusted License Plate Hole for Bolt in the Rear. Can i just remove the sensor/plug the hole? Quick Reply: Struts, Can I Move Rear bottom in one hole?